When it comes to designing a bespoke kitchen with the most popular style, it is important to keep things fresh, bright and full of unique touches that make it your own. Contemporary kitchens are characterized by sleek, unfussy spaces. Colour palettes tend to range from white to neutral tones, although monochrome schemes are not uncommon. Patterns are kept to a minimum and where used, they are strictly uniform. If you like your spaces uncluttered and with clean lines, then you will find it easy to incorporate whites, creams and plain neutral tones. Slab cabinet doors in your strict, crisp colour scheme make for the quickest way to update your tired old kitchen into one that has a more modern feel. Slab doors are free from fuss and frill, with no indentations or decorative markings. They look particularly contemporary when combined with press-touch technology or channel pulls, so that no hardware is visible. Choose horizontal cabinets rather than vertical ones for a tidy, uniform finish. An island feels like a luxury addition to a modern kitchen and is a great way to bring a fresh breath of life to your room. Choose a waterfall edge for a unique, contemporary finish. Instead of rustic, vintage-style wooden flooring, lean towards concrete or porcelain tiles for a complimentary look. 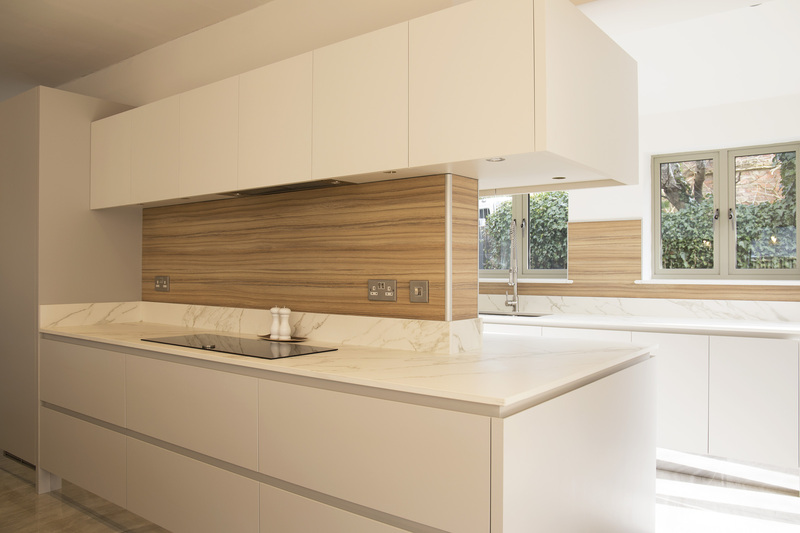 When it comes to backsplashes, these tend to be in the same finish as the worktop counters for a uniform design, typically made with engineered quartz. Be decisive with your polished finish – it either needs to be really shiny or very matte. Steer clear of in-between worktops. The sleeker and cleaner your appliances, the more they will blend with a contemporary kitchen design. Even your faucets should feature minimal lines and are best in stainless steel. Like the idea of modern design but are not keen on the coldness of the finish? You can incorporate a few warm elements to ensure your kitchen is welcoming and friendly to all. While wooden elements can come across as a little rustic and country-kitchen, the right style of wood can look great in a modern kitchen. Avoid pine, and anything with deep, knotty grains and choose varieties with less pronounced, neater grains, such as oak. You can choose to use wood in your floors, cabinets or in a subtler way, by including wooden stools. Alternatively, add a few splashes of colour to warm the room. As long as you keep your clean lines and unfussy design, shades of red, orange and gold can be very beautiful. One option is to include a flush of colour in your backsplash for a statement look. Here at Daniel Scott Kitchens, we can advise you and help make designing a contemporary kitchen easier than you might think. If you have any questions, just ask and we can help you get creative with the design you have in mind!